Tuesday, December 5, 2017 at 7 PM in the PMAC Auditorium at MJC. 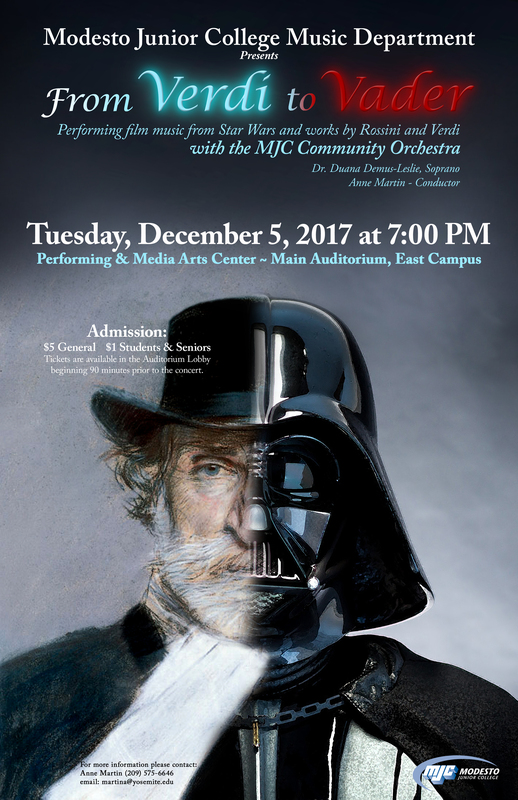 The MJC Community Orchestra will present a winter concert on Tuesday, December 5th at 7 PM in The PMAC Auditorium. The concert opens with a Rossini Overture, La Gazza Ladra (The Thieving Magpie). Also included on the program are Verdi’s Triumphal March from Aida and the Anvil Chorus from Il Trovatore. Members of the MJC Concert Choir and the Townsend Opera Chorus will join the orchestra for an energetic rendition of the Anvil Chorus! The Orchestra is proud to present Dr. Duana Demus-Leslie as our soloist in Verdi’s famous aria Ritorna Vincitor from the Opera Aida. Demus-Leslie received her Doctor of Musical Arts from UCLA and has been teaching at MJC since Fall 2008. She has had the honor of performing with many international opera stars such as Placido Domingo and Ruth Ann Swenson. The concert concludes with two Epic Suites from Star Wars. This arrangement by Robert Smith will include music from six different movies. Darth Vader and Storm Troopers from the Central California Garrison, a division of the 501st Legion, will join us for the concert. There will be plenty of photo opportunities in the lobby before and after the concert, and during intermission. The MJC Community Orchestra membership includes college students, high school students, teachers, local professional musicians, business owners, a lawyer, a farm manager, an engineer, and a pilot! Please join us on December 5th to celebrate music and community. Tickets will be available at the door: $5 general, $1 students, YCCD staff and seniors.